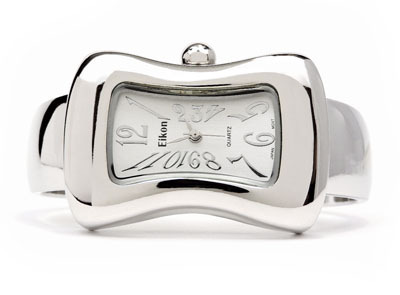 Beautiful design melting style case bangle watch. Bangle will open to fit all wrists from 6 to 7 inches. The case size is about 1.1 X 1.6 inches (28X40 mm) and has a white face with silver numerals and hands. Watch is very stylish and look great on hand, comes with the highest quality quartz Japan movement.